Restaurant Ala Marosca, has, besides outdoor seating on the mall, an indoor space with a second floor level, glass walled, pizza kitchen. Each pizza is made from scratch, including the dough. It’s a nice bit of theater. Restaurant Ala Marosca is unpretentious serving mostly pizzas and pasta, adding meat to these two Argentine food passions. I ordered a spinach lasagna with bolognaise sauce that was freshly made with just three thin strips of pasta and thick layers of spinach filling with a well flavored bolognaise. 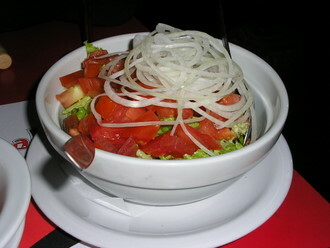 I also had a generous mixed salad. The total was only AR$28 (US$8.00). La Tienda is a pleasant converted villa on a section of Calle Aristides known for its outdoor cafes and night scene. Of course, if you are looking at the street map of Mendoza, you will notice that Calle Aristides is the fifth name for the road that starts at the bus station as Ave. Alem and ends at Parque de San Martin. This confusing number of name changes is one of the learning curves in many Argentine cities. Tree lined Calle Aristides seems designed for outdoor cafes. It's only a couple blocks from Parque San Martin. I had a nice spinach, hard boiled egg and cheese torte with a mixed salad and a dessert, rare for me. The desert was a type of bread pudding but creamier, made with bread crumbs. 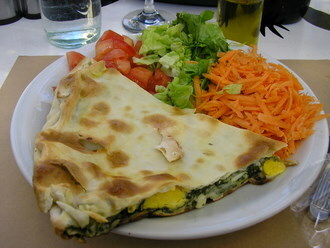 The torte is a common Argentine dish made with a thin “pizza-type” double crust. Many types of fillings can be used. Lunch came to AR$20 (US$5.50). The waitress was a pleasant bi-lingual young woman who had lived in Miami for several years. I asked her what a typical wait staff person makes in an Argentine restaurant and was disappointed that the average salary is only AR$1300/month (US$355/month). The tip rate is only 10%. She said that many Argentines do not tip. Even with the Argentine cost-of-living, AR$1300 is minimum wage. 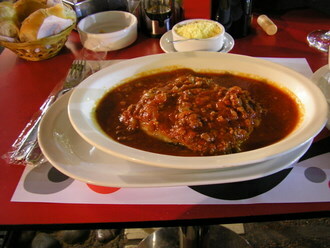 Capri is a Mendoza institution in a very unpretentious setting in the middle of the commercial district. It’s fame is pizza, but not the thin Roman pizza favored by most Argentines - and me - rather the thick crust variety favored by Mendozans with its southern Italian roots. I went there twice, once by myself and the second time with friends. I had their special the first time which, I should not be surprised, was another variation on the ham and cheese sandwich. 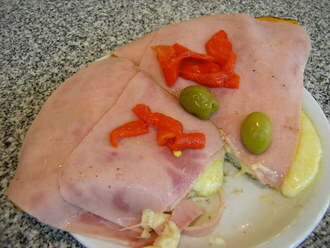 A thick layer of mozzarella cheese was covered by slices of ham with sweet red peppers and olives. My second pizza was a similar variation with a few extra additions. I’m not quite sure why Capri is so popular - it was always full and many take out orders were being filled. They serve as many of the ubiquitous large, square crustless sandwiches (ham and cheese being number one) as pizzas. Perhaps it’s the bustle and simple pleasure of comfort food just like an American diner. 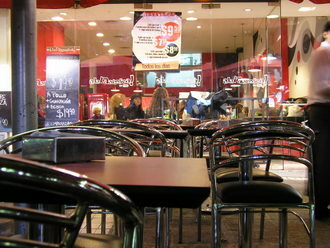 A full pizza that serves 2 to 3 people costs less than AR$15 (US$4.00). 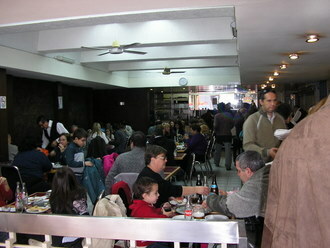 Neighborhood parillas (steak house) are scattered all over Argentine cities and towns. Customers are fiercely loyal to their favorite parillas based more on friendships, family and comfort level than on the quality of the food. Parilla Eros was a block from the hostel. I had been walking past it several times a day for several days. Brightly lit with two TV always on, it was clean and friendly. I had the full mixed grill which arrived on its own charcoal braiser still cooking its meat selections to a finish which can only be described as well done. 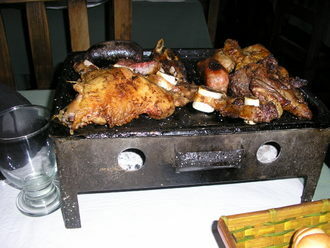 The full parilla always includes generous portions of beef, beef and lamb ribs, sausages, chicken and sometimes sweetbreads. 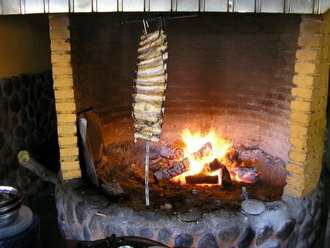 The smoky aroma is intoxicating, but Argentines like their meat (too) well done. Fortunately, more upscale parillas are starting to give diners a choice. But that’s not to disparage the pleasant experience I had at Parilla Eros. The owner was very friendly, noticing my Chef cap and impressed. A decent salad bar was included as well as two TVs - one showing soccer (of course!!) and the other the most popular prime time soap opera, the Valentines - the love lives of three brothers. I could not have had a more complete Argentine neighborhood experience - all for AR$20 (US$5.50).